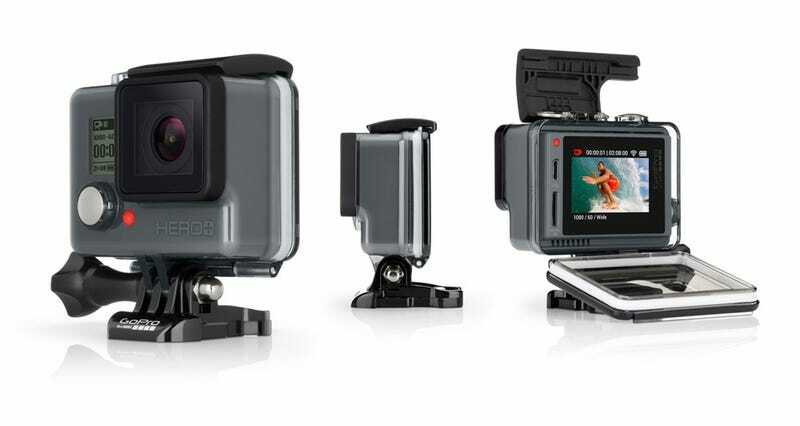 Well color us surprised: GoPro has a new camera in the middle of the year. It’s called the Hero+ LCD. It’s basically a hybrid of the entry-level Hero camera and the higher end Hero4 Silver, which was GoPro’s first camera with a built-in touch screen. Here’s what you get for 300 bucks. Like the $400 Hero4 Silver, the Hero+ LCD can shoot at speeds up to 1080p 60fps, which is twice as fast as the entry-level Hero. It won’t do 2.7K shooting or 720p at 120fps, like the Silver, and it has a dramatically reduced burst-rate: 5fps vs 30fps. It shoots 8MP still photos, which is better than the 5MP on the entry-level Hero but worse than the 12MP on the Hero4 Silver. It does, however, have built-in Wi-Fi and Bluetooth radios so you can use it with a mobile app, something you can’t do on the cheap Hero. Like the entry-level cam, the Hero+ LCD is built into a non-removable waterproof case, which is rated to depths of 131 feet. If you want to charge or swap micro SD cards you just open up the back panel to access the slots and ports in the back. We assume that you’ll need to open it in order to actually touch the touch screen, but you should still be able to use it for framing shots even when it’s closed. The big disadvantage here is that you can’t swap batteries in and out, and GoPro cameras aren’t known for their stamina. There’s also no HDMI out for instantly hooking it up to a TV. One interesting twist is that GoPro is debuting an in-camera video trimming feature. Basically, you’ll use the touch screen to make short clips out of longer ones, so you can share a highlight quickly and more easily from your smartphone. This is definitely a handy feature and we were told it will be coming to the Hero4 Silver (and the Hero4 Black if you have an LCD BacPac) later this summer via a firmware update.